Gets a value that indicates the relative progress of downloaded content. A value between 0 and 1 inclusive that represents the amount of total content downloaded. Multiply by 100 to obtain a percentage. This property is read-only. The default value is 0. Once you have invoked the Send method on the Downloader object, the DownloadProgress property allows you to determine the percentage of total content downloaded. The return value is expressed as double value between 0 and 1.0 inclusive, with 0 representing no content downloaded, and 1.0 representing all content downloaded. The DownloadProgressChanged event can be used monitor the progress of a download request. The DownloadProgressChanged event occurs whenever the percentage of total content downloaded increases by 0.05 or more, or reaches 1.0. 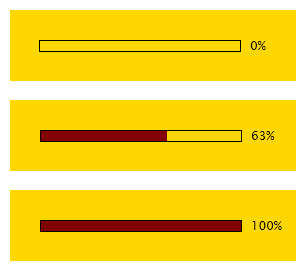 A visual progress indicator can be constructed from a wide variety of XAML content, including animated objects.